CODING MANUAL INFORMATION IS AVAILABLE FROM THE CHAPTER AUTHORS, AND THEIR E-MAIL ADDRESSES CAN BE FOUND ON PAGE XV OF THE BOOK. Family studies is an area that has enjoyed the benefits of conceptual and methodological advances in recent years including the widespread adoption of observational research techniques. The selection of an appropriate coding system is critical to achieving a better understanding of the complex family processes related to normative and pathological development. 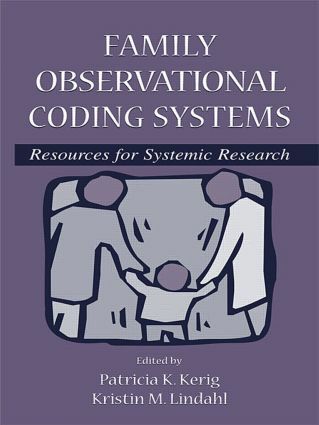 This book presents 14 examples of family observational coding systems, chosen for the wide range of constructs and phenomena they capture. Each system is described in detail, and excerpts from the coding manual are presented (links to the full coding manuals are available to purchasers of the book at LEA's Web site, www.erlbaum.com). Each chapter follows a consistent outline, so that the different coding systems can be more easily compared to one another. They include the theoretical underpinnings of the measure, its reliability and validity, the coding process, strategies for coder training, and examples of studies in which it has been used. This volume will prove invaluable to students and researchers in family studies, clinicians, and other practitioners who need to interpret data from family observations. "Patricia Kerig and Kristin Lindahl have put together a much-needed compilation of contemporary family-based observational coding systems….this is an excellent and necessary text for graduate students and young faculty who want to learn about coding the interactions of family members." "Two overview chapters by the editors spell out the problems in scheme design, thus establishing the book's value as a background summary for new investigators." Contents: Preface. P.K. Kerig, Introduction and Overview: Conceptual Issues in Family Observational Research. K.M. Lindahl, Methodological Issues in Family Observational Research. J.N. Melby, R.D. Conger, The Iowa Family Interaction Rating Scales: Instrument Summary. C. Forbes, S. Vuchinich, B. Kneedler, Assessing Families With the Family Problem Solving Code. K.M. Lindahl, N.M. Malik, The System for Coding Interactions and Family Functioning. A. Russell, J. Mize, J. Saebel, Coding the Social Dimensions of Parent-Toddler Play From a Vertical/Horizontal Perspective. E.B. Gordis, G. Margolin, The Family Coding System: Studying the Relation Between Marital Conflict and Family Interaction. P. Florsheim, L.S. Benjamin, The Structural Analysis of Social Behavior Observational Coding Scheme. J. McHale, R. Kuersten-Hogan, A. Lauretti, Evaluating Co-parenting and Family-Level Dynamics During Infancy and Early Childhood: The Co-parenting and Family Rating System. E.W. Lindsey, J. Mize, Measuring Parent-Child Mutuality During Play. A.W. Harrist, G.S. Pettit, The Social Events System: Creating and Coding Focused Narrative Records of Family Interaction. M.S. Robbins, O. Hervis, V.B. Mitrani, J. Szapocznik, Assessing Changes in Family Interaction: Structural Family Systems Ratings. A. Mahoney, A. Coffield, T. Lewis, S.L. Lashley, Meso-Analytic Behavioral Rating System for Family Interactions: Observing Play and Forced-Compliance Tasks With Young Children. M.A. Westerman, Measuring Triadic Coordination in Mother-Father-Child Interactions. B.H. Fiese, A.J. Sameroff, H.D. Grotevant, F.S. Wamboldt, S. Dickstein, D.L. Fravel, Observing Families Through the Stories That They Tell: A Multidimensional Approach. B. Paley, M.J. Cox, K.W. Kanoy, The Young Family Interaction Coding System.